Chocolate Chip Cookie Lovers of the World!! UNITE! Nine years ago, when I went low-sodium, I thought.. well, there go the cookies. Nine months ago, when I went vegan, I thought.. well, that’s truly it for me. But you know what? I was wrong. You do not need butter, eggs, milk, or salt to bake the very best chocolate chip cookies of your life. What you do need? THE RIGHT RECIPE! These cookies will amaze you. Not only are they salt-free, they’re almost sodium-free, containing a mere milligram per cookie. They have zero eggs and butter, yet the plump, chewy texture is all there. 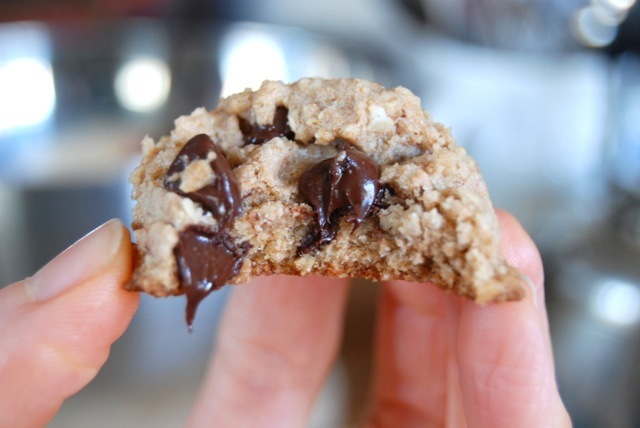 These are the chocolate chip cookies you’ve always known and loved. The ones you scarfed down before your health got in the way. Chewy and hefty and 100% REAL. There’s no need to apologize. No need to explain. No need to do anything but bake a batch and offer them around. 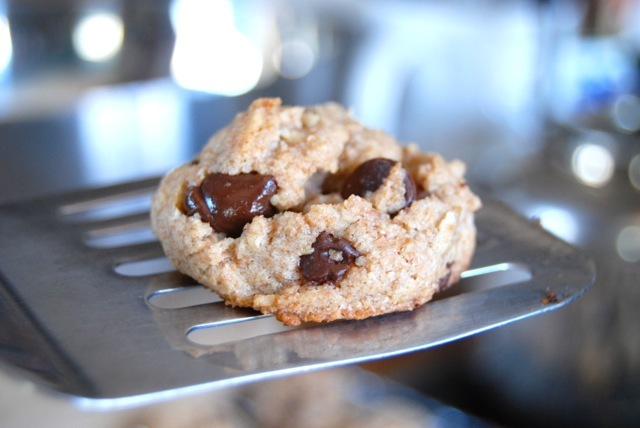 No one will know they’re anything but the most delicious chocolate chip cookies ever. Even better? 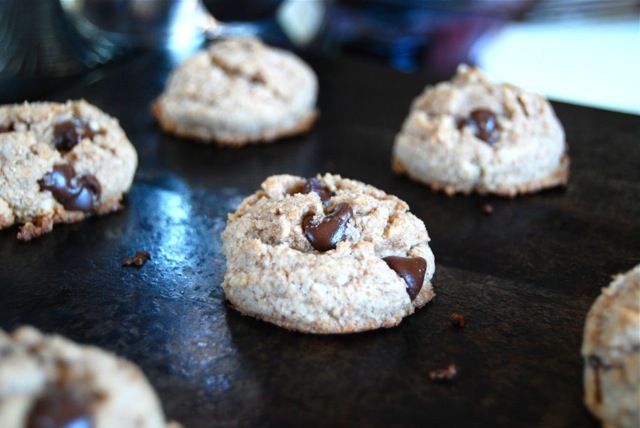 These cookies are chock full of heart-healthy whole grain, in the form of both oats and whole wheat flour. You can use standard whole wheat flour, but I highly recommend using whole wheat pastry flour if you can find it. The finer the flour, the finer the cookie crumb. As for the coconut oil. Do not melt it. Simply scoop/scrape out of the container using a stiff tablespoon and add to the batter that way. I buy my coconut oil at Trader Joe’s; not only is it great quality, but it’s CHEAP. We’re talking $5.99 a jar! I also buy my semisweet chocolate chips at TJ’s. Not only are they delicious, and inexpensive, but they’re also VEGAN. Something you can’t always bank on when it comes to semisweet morsels. For the vegetable shortening, you can use Crisco, but I prefer Spectrum Organics Non-Hydrogenated Vegetable Shortening because it’s trans fat free. Preheat oven to 350 degrees. Get out a couple of baking sheets and set aside. Cream together the oils, shortening, and sugar. Add remaining ingredients and blend well to combine. To evenly distribute chips, add them halfway though the process. 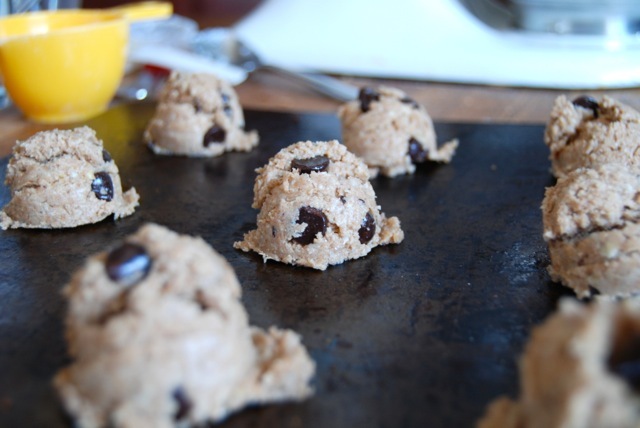 Scoop dough by tablespoonfuls onto the ungreased baking sheet. A small cookie scoop works perfectly for this. Place baking sheet on middle rack in oven and bake 10 minutes. Remove sheet from oven and allow cookies to cool 3 minutes before removing to a wire rack. 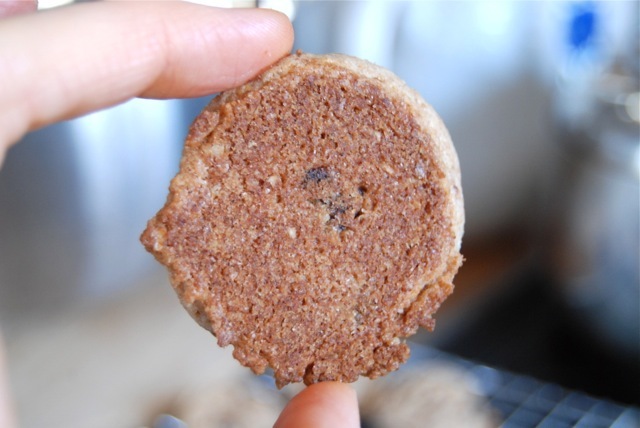 Let cookies cool to touch before storing in an airtight container. This entry was posted in Cookies and tagged Spectrum Organic Non-Hydrogenated Vegetable Shortening, Trader Joe's, Trader Joe's Coconut Oil, Trader Joe's Semisweet Chocolate Chips. Bookmark the permalink. 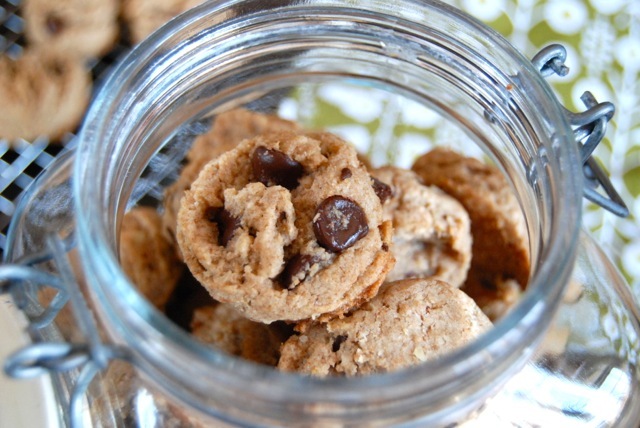 2 Responses to Low Sodium, Vegan Chocolate Chip Cookies that taste like the REAL THING! So… no eggs means I can eat at least half the dough ‘raw’?! Hah! YES, if you were so inclined, you can definitely eat the dough raw w/out fear of reprisal. As someone who (cough) may have (cough) indulged and been… shall we say, SICKENED, I can say this is a real selling point – in addition to the dough baking into some seriously delectable cookies! Thanks for reminding us of the added bonus, Inky!